Get ready to shake up your game! Within these pages, the designers of the Pathfinder Rolleplaying Game unleash their wildest ideas, and nothing is safe. From totally revised fundamentals like core classes and monster design to brand-new systems for expanding the way you play, this book offers fresh ideas while still blending with the existing system. With Pathfinder Unchained, you become the game designer! 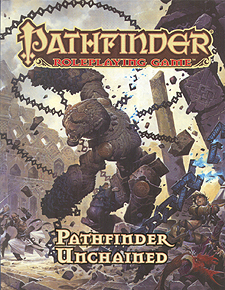 Pathfinder Unchained is an indispensable companion to the Pathfinder RPG Core Rulebook,. This imaginative tabletop game builds upon more than 15 years of system development and an Open Playtest featuring more than 50,000 gamers to create a cutting-edge RPG experience that brings the all-time best-selling set of fantasy rules into a new era. New skill options for both those who want more skills to fill out their characters backgrounds and those seeking streamlined systems for speed and simplicity. Magic items that power up with you throughout your career - and always maintain variety while still letting players choose the "best" magic items.